The major part of the accommodation facility at Yadagirigutta is available on Uphill by SLNS Devastanam, Yadagirigutta and Most of the tourists like to stay on uphill, they might be like to stay near to temple and to avoid traffic problems, time delays and to maintain their trip as per their plans. while your planning trip to yadagirigutta you may consider the following accommodation details also for your convenient. specially if you are belongs to any of the below mentioned community, this will be helpful to you. Along with this you can find private hotels, lodges, and daily rooms also at down hill yadagirigutta. Normally on holidays and on special occasions it is very difficult to find a accommodation on uphill and tourists cant get any other option than move to down hill in that situation. Accomodation & Annadanam facility by Community organizations and SLNS Devastanam, Yadagirigutta. Free Food supply was started in 1989 in Devastanam. they started to supply only for 50 people then time to time they increased and presently they are supplying free food for 500 persons a day. the food coupons are distributed between 11 to 12 AM in Darshanam queues of the main temple and it is arranged in Sri Chakra Complex Cellar on uphill. Brahmana Annadana Satram (Down Hill) Free food fecility by the Brahmana Community for their members near to Check post on uphill road. Is mobile phones allowed in temple by switching off or do we have any mobile store counters inside or outside temple. @Manoj, Mobile phones not allowed in temple. yes, there is a counter out side the temple for it. Is it better to get down at Bhongir or Raigir railway station ? Please suggest where we can get the better transport to reach yadagirigutta ? If you are coming alongwith family i can suggest you to get down at Bhongir Since there are lots of trains available for Bhongir and RTC Buses and PVT vehicles stops at Bhongir Raiwalstation. at present Raigir Station road is not clear due to the 4 line road works and only Passanger trains halting at Raigir. Hi am Naveen from Hyderabad am requesting temple committe to arrange online room booking. its very difficult to plan with family without confirmation of rooms. @Naveen, there is online room booking facility available through meeseva centers. check in any meeseva center of Telangana. @Pramod Kumar, there is no direct website for room booking, you have to book through meeseva center only. pls give me the details of online accommodation book pls which website to use the room booking through online and kalyanam. 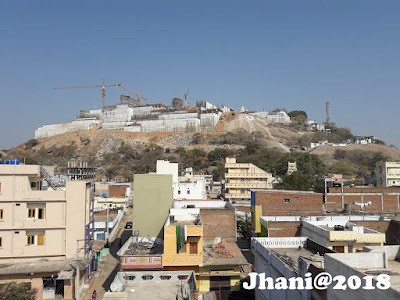 I would like to know that still the construction work is going on at uphill yadradri.... and can we find rooms for stay at uphill? Vijaykumar Gaaru... the Constructions works still going on and all the accommodation buildings demolished... only few rooms at Sri Chakra Complex and Tourisms Haritha Hotel rooms available at uphill. is there any on line booking well in advance like ttd . Yes, at SLNS Devastanam Uphill Fee Annadanm center available for pilgrims, running by Devastanam itself.